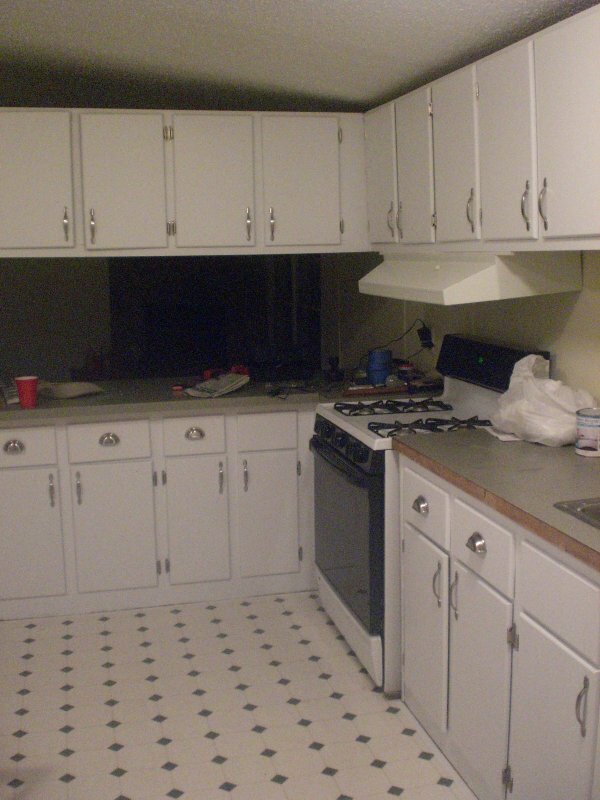 Does the cabinets look like they were painted, or do they look like they were bought in the white color. From the photos, they really look nice. Good job. Also, can the cabinet rescue be changed to a darker color? I just found your comment. 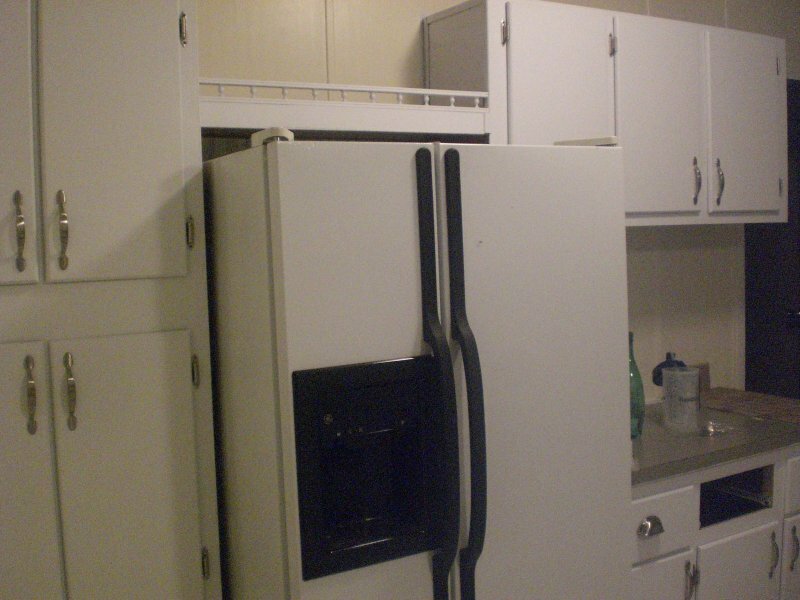 The finished cabinets look professional — like they came that way. You wouldn’t know they were repainted unless I told you. Everyone who sees them comments on how beautiful they look. That’s all due to Cabinet Rescue paint! Finally, yes, you can have the paint tinted to any shade you like. You just take the paint to Wal-Mart, Lowe’s, Home Depot, etc. and have them add the tinting and shake up the can. Piece of cake! The Cabinet Rescue paint is very reasonably priced when you consider how little you need to do a big room! I bought two quarts and ended up using only one and a half. I plan to use the extra paint to redo the hall bathroom cabinets one of these days. You can get Cabinet Rescue at http://www.cabinetpaint.com/ for $19.95 a quart, but check http://www.cabinetrescue.com/ first, since that site will tell you if any retailers carry the paint in your area (and then you wouldn’t have to pay for shipping). Again, this might seem expensive for a quart, but it takes so little paint to get the results you want. I did three coats on every cabinet front, all doors, and all drawers, and it still only took a quart and a half for this large kitchen. It’s just great stuff! the high density foam roller works so well because I really didn’t want the expense or hassle of a paint sprayer. I also love the cup pulls, I will be using them also but I paib about $5 for each one of 7. All in all I have 24 doors to paint plus the cabinet facings. Thanks again for the info and the oictures look amazing. I’m so glad to have pass by your site. it has helped me so much. we have been wanting to redo the aweful cabinets in out trailer. those prefab designs are so outdated. Thank you so much for posting this! I’ve been wanting to paint my old kitchen cabinets since we moved into this house last year. Everyone told me it wouldn’t be worth all the work and that it would come out looking hideous. You’ve convinced me that it CAN be done! Did you also try this with a bathroom vanity? My question is.. would someone with little paint experience be able to pull this off? I’m not clueless, but not a professional, either! You CAN do it! It really doesn’t take a lot of paint experience–just elbow-grease and a willingness to do all the steps. Don’t skip any of them if you want top-quality results. De-greasing the cabinets thoroughly is vitally important to start out. The paint just won’t adhere nicely if you have greasy spots or streaks. Also check for Scotch tape. I missed a piece that was on one of our drawers, and the paint has since chipped off that one spot. I will have to photograph it and do a cabinet paint update! You can definitely use Cabinet Rescue in the bathroom. That is on my list of big projects down the road. The pre-cleaning job will be really important in the bathroom, as cleaners, soaps, shampoos, etc. splash and leave residue. Clean and sand, and you’ll be ready to paint. I’m no professional myself; I just can’t stand the thought of paying through the nose for a paint job that can be done with determination on my own! 😉 Have fun painting! hi, WOW! they really look great. my husband and i are arguing over what to do with our kitchen. we have some cheap stock laminant cabinants and there is pleny of room to add more. our first problem is to just add more is impossible because the new stock cabs. does not match the existing ones. so he wants to buy all new!! but i think we should just buy the closest color wood in stock and paint them all. do you think this product would work on regular stock cabinents from home depo or lowes? Hi, Rachel! Yes, Cabinet Rescue paint will work on any laminate cabinet surface. You could easily get all your cabinets to match if you buy the closest shape you can to the cabinets that already exist, then sand and paint them all the same shade. Sounds like a great, money-saving plan to me! Did you prime the cabinets before painting? Did you paint both sides of the doors and lastly, did you have any problem with paint on the edges leaving a ridge on the oppisite side of the doors. I have painted ONE door and had that problem. Any suggestions. From what I saw your cabinets look great! Just re-doing my workroom. It had old Formica cabinets which were useful, but heinously ugly old wanna-be wood. Cabinet rescue covered it up well in 2 coats. If I wanted them all white, I would use 3 coats also, but bought an orange alkyd paint. In response to the last post, Cabinet Rescue can be tinted to pastel colors, but I wanted a bright juicy orange which is not possible. I was told you can paint over cabinet rescue, but I am choosing to wait at least 72 hours before I paint over it. Then, you have to wait 20 days for the final cure. I wish there was a phone number on the can so I could ask someone if it would be just as durable if Cabinet Rescue could be painted over in a darker, more saturated color. I have another question. Compared to other finishes, would you say the finish of the paint you used is, glossy, semi-glossy, or satin? 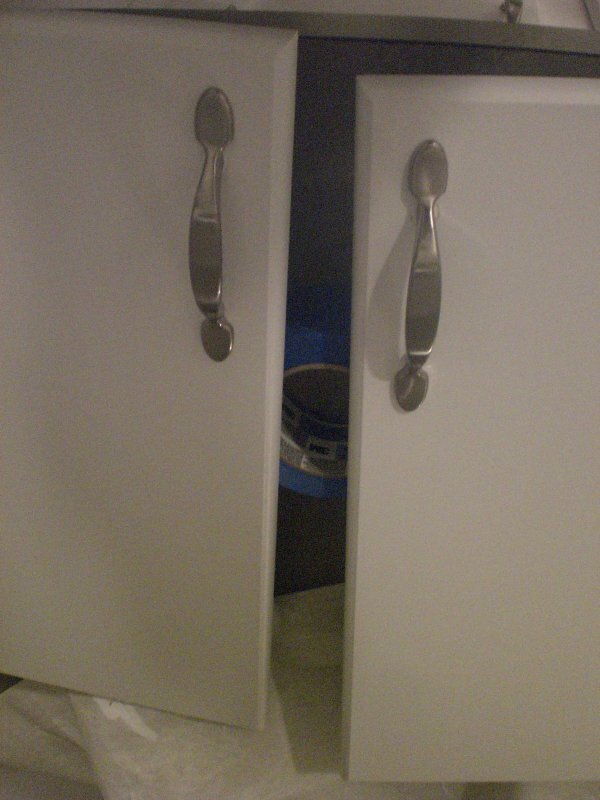 I am still debating what to do with my cabinet doors. Hi, Marti! The cabinets look like they came in that color (until you open the door and see the insides!). 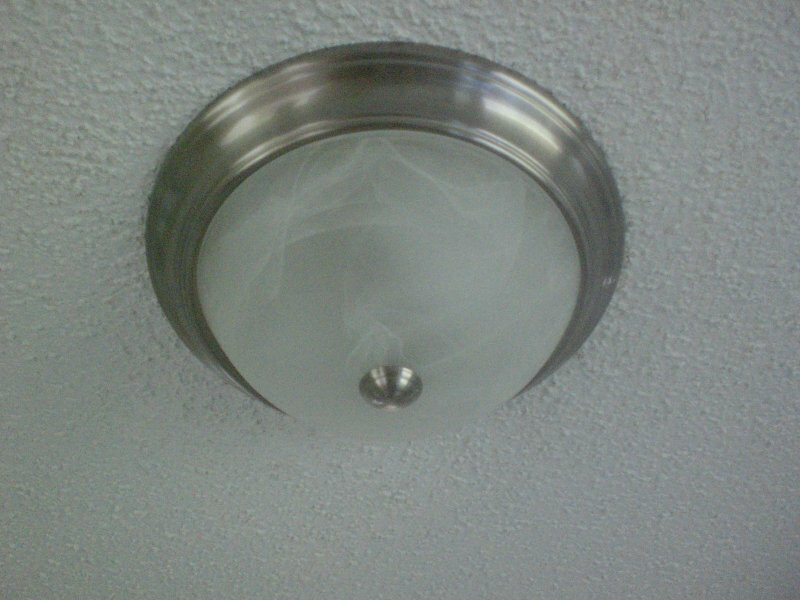 The finish is very smooth–looks sprayed or baked on rather than rolled. 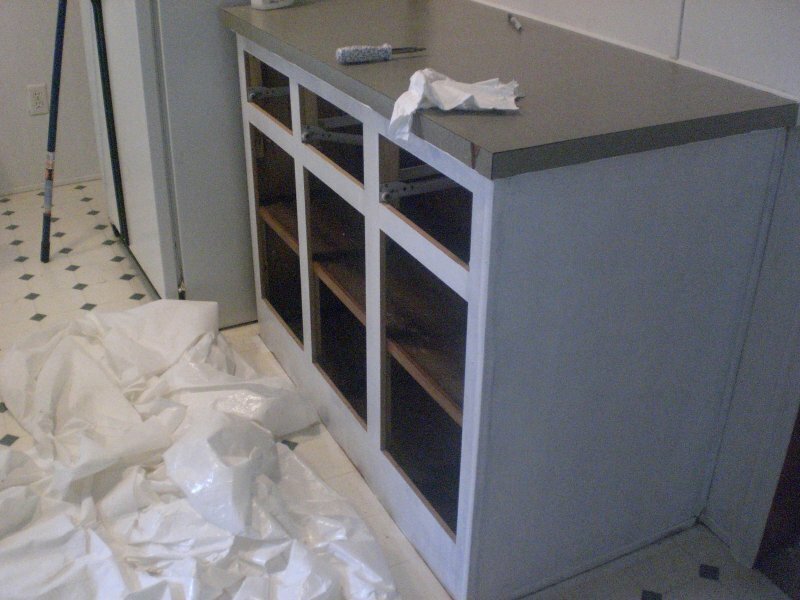 Cabinet Rescue can be tinted at any paint store. Someone else made the comment that you could only use pastel tints, but I’ve never read that anywhere else, so I’m not sure about its accuracy. I’d assume you could tint it any way you liked, since tinting doesn’t change the make-up of the paint itself, and very little tint is needed to change the color. Hope this helps! This looks great! My husband and I are beginning to remodel our kitchen. What type of countertops do you have. We need to replace ours and I really don’t like the laminate because of scratches. Cabinet Rescue is on my list of things to do now. You said you only used one can for your whole kitchen? hmmm. I have a snow white kitchen and would like to add some color. So I’ll look at the mid-upper tone colors. What time of the year did you do this? Does the outside temperature make a huge difference? Very nice update! I recently repainted my father’s kitchen from that really dark wood to an off white. It really makes a big difference. In about 2 months, the overabundance of white will look drab and dingy as it collects the airborne residues from cooking. Not to mention the daily use by the occupants of the home. The oils on their skin and the very breath they exhale will add to the dinginess. Doubly so if they are smokers. 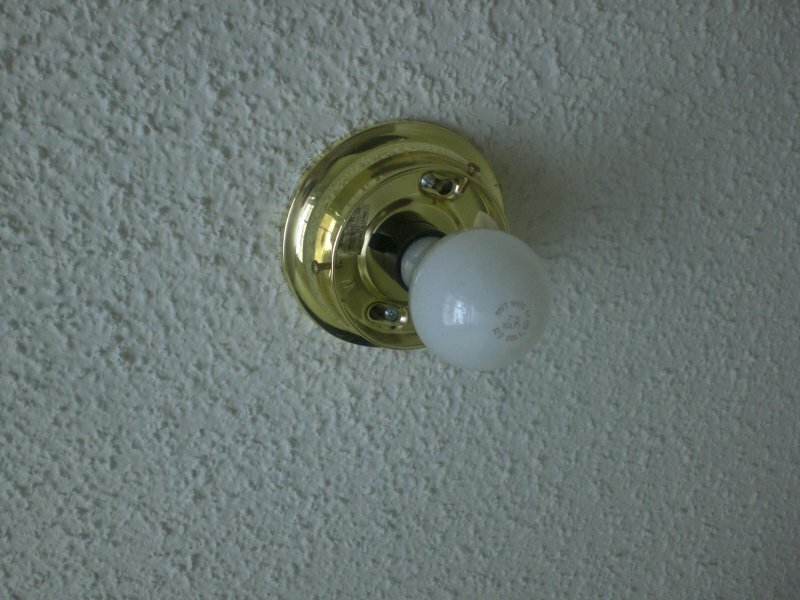 A better solution would have been to use bolder colors, like reds and yellows, with some lighter colors as accents, knock a hole in the outside wall and put in an actual window (may require a professional if you’re not comfortable with the work yourself), and then get entirely rid of the current lighting sources. With the new window, indirect lighting would work well, but also a track lighting system that uses 75 watt bulbs. An eight foot track with about 5 lights would provide ample light, and with the track fixtures you can ‘aim’ each one right where you need it. The total cost would be about the same, if you do all the work yourself. And, the bolder colors will not become dingy quite so quickly. I love what you did to your cupboards, and excited to learn that there is a product to use to make that change. I associate white with cleanliness, and that is important to me expecially in a kitchen or bath. I recently bought a very old mobile home. With the dark paneling and dark cabinetry. I can’t wait to really brighten up the place. I can add nice colorful accent pieces to both rooms to take away some of the starkness of an all white room…. I do like the buttercream walls too!! Does Lowes, Home Depot or Walmart charge for mixing color into the paint? I might want to take the paint from bright white to light ivory. We also needed to update our kitchen without going bankrupt. We changed the counter tops for Silestone Quartz and painted the cabinets. I am so happy with the results. My kitchen is so bright and cheerfull. We don’t even haave to have the light on because the white cabinets brightens it up beautifully. It looks like a brand new kitchen. People think that we also replaced the cabinets!!! I love this paint and I recomend it if your cabinets are still in good shape. 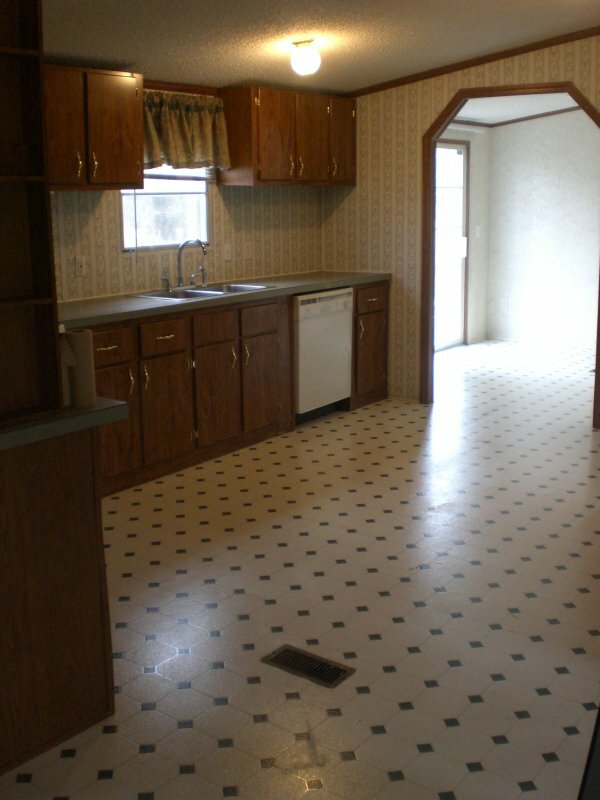 I just bought a foreclosure so I have little info on the age of the kitchen cabinets. However, they less than 2 yrs-almost new. They are in the standard honey colored maple that is so common these days. I am looking to take the cabinets to white or cream, so Cabinet Rescue looks like it could work. WHAT AN AMAZING PRODUCT!! We priced the cost of installing new cabinets in our kitchen and just could not afford this. A friend told me about this product. We took down all the cabninet doors and started painting. 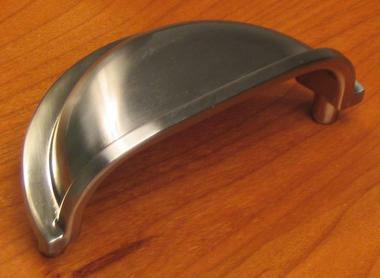 We added new handles and our kitchen looks brand new. The product does everything that it claims to do. We just refinished our ugly cabinets and now all of our neighbors wants theirs redone. They look like new cabinets. Hi there! Sorry to take so long to reply. Yes, the reason you sand is to scuff up that glossy layer to make the Cabinet Rescue adhere better. You do not have to prime over the “varnish” — you just have to give the cabinets a going-over with a rotary sander. I didn’t sand longer than three minutes per door, and the paint stuck fast with no problems. A rotary sander is the best, since you’ll give “tooth” to the entire door surface for the paint to stick to. That’s all you need to do! Have fun! Well, thanks for the nice words, but Cabinet Rescue isn’t “my product” — it’s just one I am happy to recommend! should i use this instead of sanding? I ran across this website, and really like some of the things you are doing with your house. My question to you is about your kitchen. My cabinets are brown, and they are the particle board. I don’t like the white cabinets, but not sure about painting them brown? Have you got any suggestions?? Thank you for all your advice you are giving. There just are not alot of articles for re-doing a double wide trailer?? I am totally delighted with how Cabinet Rescue has reserected my kitchen cabinets. Due to a sickness in the family I was not able to complete the kitchen. I only competed 1/3 of the kitchen and am now working on the remainder of the cabinets. The finish looks professonal. I followed the instruction to the letter and the results was just what I wanted. I didn’t have funds to buy new hindges, handles and knobs so I cleaned the old ones with a degreaser. Then I sanded them lightley. After they were dry I took a used cardboard box and poked small holes in the top to put the screws for the hendges, the knobs and handles in the holes. I then painted them with 2 coats of Krylon Brushed Metallic Satin Nickel paint, letting each coat throughly dry before applying another coat. Since the hindges are partically exposed and the screws are exposed I had to paint them. The look like new! Everyone who has seen the finished cabinets can’t believe the cabinets and hardware was painted. I will be painting my counter tops as soon as I have finished all the cabinets. There is a kit at Lowe’s called Mondern Masters Countertop Transformations. The technique is simular to Cabinet Rescue. The end results looks like stone. I can’t want to start that project. 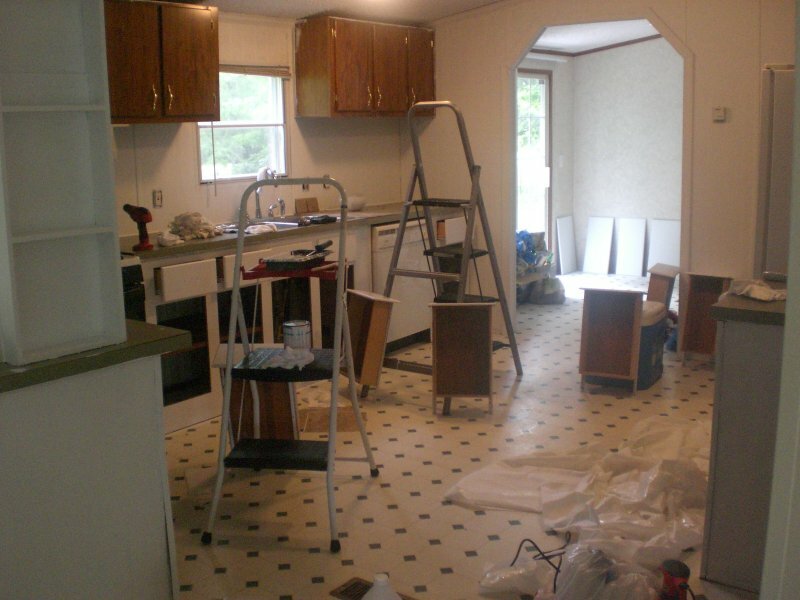 When I have finished the kitchen I will submit a photo for you to see the before and after. My kitch cabinets are 30 years old but in good shape so I don’t want to replace them but they need redone. They are of the very dark – and I want them like light oak stain. I understand that I can not stain them to light color, so I wondered about painting them and if there was such a color as a oak stain color? Hi, we are buying a foreclosure home in the Orlando area and wanting to re-do the laminate kitchen cabinets. I would like to add some trim to them- maybe use some 1×4 and miter the edges. My question is this: if I apply trim in the “bare wood” (unfinished) form, do I need to prime it before applying the Cabinet Rescue paint? Thanks for your help, and check back to my blog for updates on our home! Hi, Amy! You do not have to apply primer before you use Cabinet Rescue, but you may need one extra coat of Cabinet Rescue if you’re going over bare wood, since it soaks up a bit more paint. Hope this helps! Hi, Linda! You can tint the Cabinet Rescue paint, but it is a white base, so the resulting shade if you add an oak color will be “pickled oak” rather than true, clear oak brown. But, yes, you can tint it. Hope this helps! That is fantastic, Judy! Sounds like you had a total kitchen makeover — with just a little paint and elbow grease. These are my favorite kinds of stories! Hi, Rhonda! You can tint the Cabinet Rescue paint–just not very dark, as the base is white-white. You can tint them to grey, off-white, etc. A friend of mine did a creamy off-white that turned out gorgeous. The paint mixer at your local Lowe’s or Home Depot will know how much you need to add to get the right shade. Hope this helps! I think I’d stick to sanding, as Cabinet Rescue needs no primer, and sanding is free! Hi, Maryann! I’m afraid I don’t know of any other local sources for the paint. I ordered it online from the manufacturer’s site. Hope you can find it! I purchased Cabinet Rescue and re-did my Bathroom Vanity. It looks great! I put new hinges and handles on in brushed nickel and wow does it look nice. 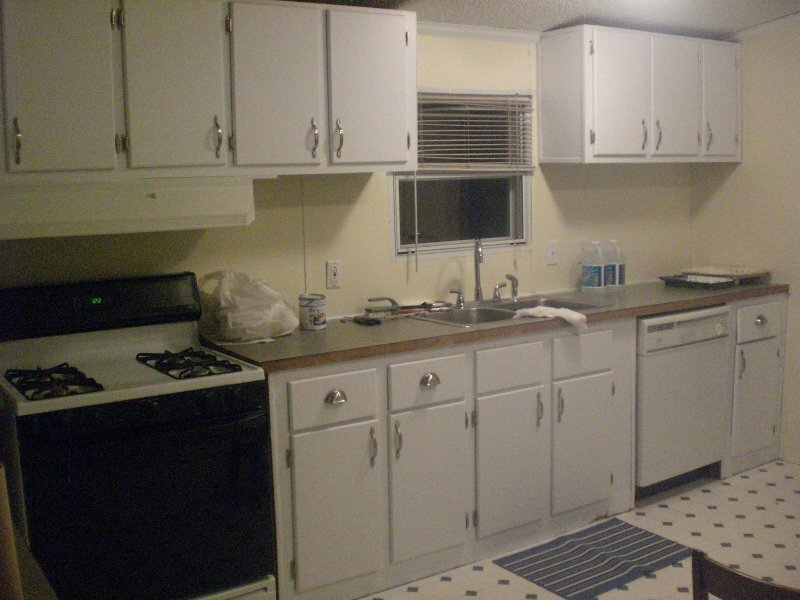 I have a mobile home in Florida that I am redoing the kitchen cabinets too. Can’t wait to see how different they will look when done. I primed the bathroom vanity, but not sure if I need to on the kitchen cabinets. They are partical board that are white, but they are old. Do you think I need to prime first? Thanks and by the way, your kitchen looks great! That is fantastic! I think if you are painting over raw particle board it would be wise to prime it. But it shouldn’t be necessary if the cabinets were already painted. Just rough them up with the sander and go from there. Have fun! I learned of Cabinet Rescue yesterday (from a realtor). You all speak on this site of “laminate.” My cabinets are the oak bases with the off-white/beige panels and no handles. The typical “ugly” 80’s style cabinets that were put in “everywhere.” Is this the laminate you speak of or is this a different material? And, of course, can I re-do with Cabinet Rescue? Hi, Bette! 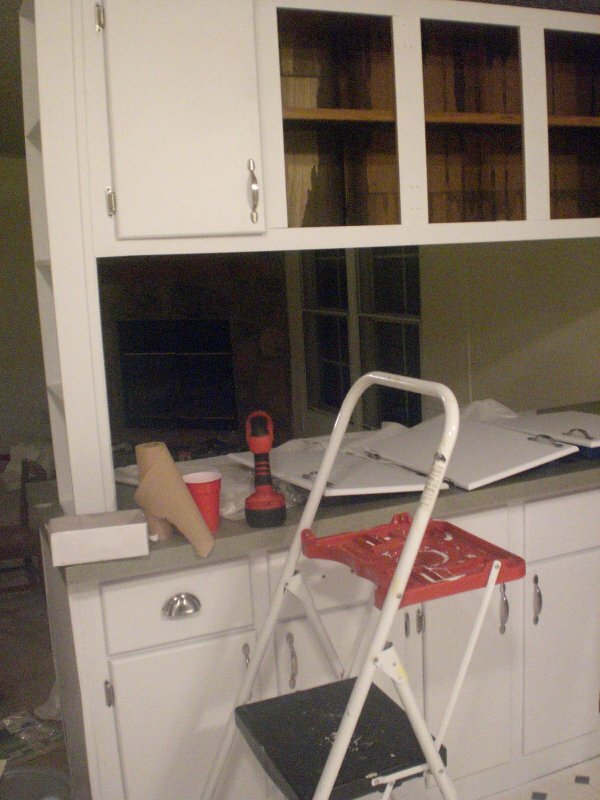 If the cabinets are smooth, then you do need to rough them up before painting. I show how to do this in my posts. Have fun!